“Danny didn’t have to swamp it up too much, it was already swamped up pretty good when it came to him”. 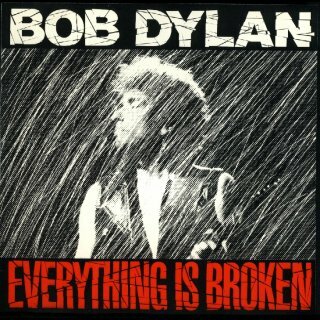 That’s Bob Dylan writing about the only single from his 1989 album Oh Mercy, “Everything is Broken” in his memoir, Chronicles Volume 1. I’ve said previously that Chronicles may be the best memoir I’ve ever read by a someone who is primarily famous for something other than writing, and the Oh Mercy chapter is probably the best one in the book. I’ll come back to it when I write about the album as a whole. The “Danny” in that quote, of course, is producer Daniel Lanois, who was recommended to Dylan by Bono. Lanois worked with U2 on a number of albums in the 1980s and 1990s. He is renowned for polished – some would say over-polished – nature of his production. As Dylan tells it, the two men initially struggled to find a common vision, but Lanois ultimately produced the latest of Dylan’s many comeback albums. The song uses the word “broken” thirty-four times in only four verses! I think that the appeal of the song is the performance. Dylan is entering his full-on growly mode, and Lanois plays that up. It’s a despairing song from a man approaching fifty. It is relentless and dark and slightly despondent. Dylan has worked these waters before, but there is a big difference from the despairing howl of the young man on “A Hard Rain’s a-Gonna Fall” and the resignation of the older man on this song. There is no hope here. The song ends with its best imagery: “Hound dog howling, bullfrog croaking / Everything is broken”. In Chronicles, Dylan notes that he tried to tack on some optimism to the end: “Broken strands of prairie grass. Broken magnifying glass. I visited the broken orphanage and rode upon the broken bridge. I’m crossin’ the river goin’ to Hoboken. Maybe over there, things ain’t broken.” It wouldn’t have worked. There are alternate versions of this song on a lot of the Oh Mercy outtakes bootlegs, and also an officially released one Bootleg Series v8. The one on Bootleg Series is less dark, less harrowing, and you can see why the version that is on the album is the one that was selected. The lyrics on that version are substantially different, and they give a good sense of Dylan’s songwriting evolution. The bridges, in particular, are quite substantially different. Definitely one of the better Dylan songs from the 1980s. WordPress is fighting me on embedding this alternate version, so click on through.